This may not come as a shock if you’re familiar with me at all, but I’m a huge sucker for pretty packaging. And speaking of packaging, I think one of the most exciting parts of giving a gift to someone is the millions of ways you can wrap a present. I’ll admit that I’ve bought entire rolls of wrapping paper (even when I knew I only needed a few feet) because I fell in love with the print or pattern. Some home and fashion designers have created wrapping papers, making it even more impossible to resist the pretty paper. That got me to thinking…why this gorgeous paper only see the light of day when it’s being given to someone else? I’ve thought up of a few ways to give your giftwrap a second life. The ultra chic designs can give anyone’s office space a total facelift – plus, it’s way cheaper than buying something premade that’s often not as cute. Several stationery stores even sell individual sheets of wrapping paper (the perfect size for crafting) in patterns that encapsulate lots of hobbies and interests, like maps and cooking. So if you’ve found some paper you can’t bear to give away, hold on to it. It’s a gift to yourself! The only storage I put in any office space has to be unique – I can’t settle for basic! Patterned boxes can get pretty costly, however, especially when you need to buy multiple. Save some serious cash by selecting a plain storage box or crate, made out of wood or a strong cardboard, and then modge podging it with some fabulous giftwrap. 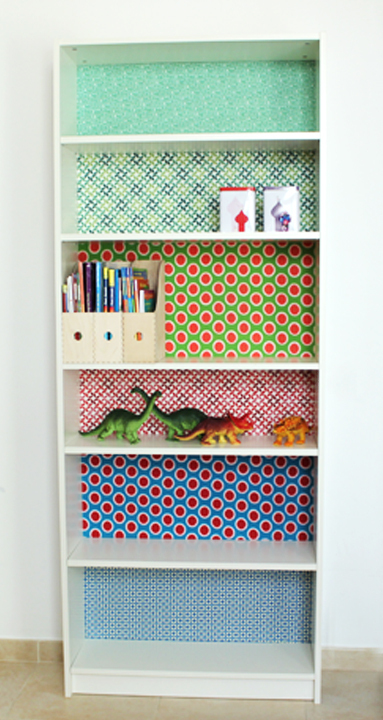 You can totally mix and match or just choose one pattern for all of your boxes. If you’ve never used modge podge before, look up directions online and follow them carefully. Be sure to use a ruler to measure the paper accurately so it’s even all around. If you’re really feeling eclectic, you could make the box and lid two different patterns. Though there are many types of finishes (glossy, satin, etc. ), my personal favorite for storage boxes would be matte – but it’s totally up to you! If people frame fabrics, why not frame wrapping paper? It’s a great alternative to any kind of wall art, and definitely less stressful to find as well as way cheaper. As most giftwraps are simply a repeated static pattern, framing only one large piece doesn’t suit it as well as hanging multiple frames of the same or complementary prints. Three frames of the same size are generally your safest bet. Because of the way the glass in frames catches the light, select a matte wrapping paper for a more polished look – the idea here is to make it look like it’s not what it actually is. I think every great office has at least one custom piece, and bookcases are a great way to do this. Kind of like a paint alternative, adding some color or pattern to the walls of your bookshelf is an easy method of infusing some interest in your space, as well as making a basic, inexpensive furniture piece something unique. As tempting as it is to pick some quirky or trendy giftwrap, keep in mind the intended lifespan of your bookshelf and veer toward a more classic pattern, such as stripes or polka dots. Unlike the frames or modge podged boxes, feel free to go for wrapping paper that has a glossy finish. Which one of these ideas is your fave? Can you think of any other decorative uses for wrapping paper? Let me know in the comments!